Many adoptee rights advocates have taken aim at NY's A5036B and have denounced it as "not adoptee rights", "setting us back" and "a perpetuation of the Tann/Lehman legacy" (a reference to how NY's Gov. Lehman adopted children from notorious "baby thief" Georgia Tann, and then promptly signed the 1936 law that retroactively sealed adoption records and original birth certificates in New York). A5036B passed the Assembly on June 20 and the companion bill, S4845B, passed the Senate on June 21. As of this writing, the bills have yet to be delivered to Gov. Cuomo. In late July, some 46 organizations, along with over 500 individuals, endorsed a letter to NY's Gov. Cuomo urging him to veto the bill. That's a pretty impressive turnout and our deepest thanks go to Greg Luce of Adoptee Rights Law for making it happen. 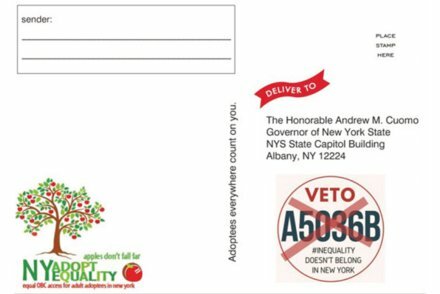 Other recent efforts include a postcard campaign by New York State Adoptee Equality and updates to a longstanding petition from Tim Monti-Wohlpart. Now, there are still a few supporters of A5036B and they are just as adamant that it would be "the only chance" for many NY-born adoptees to obtain their original birth records. A5036B has been called "half a loaf" and "baby steps" by other supporters, the idea being that some/many NY adoptees will get their OBCs under this bill and the rest will be taken care of by some future amendments that advocates have been promised if they would just support the current bill as "the best we can do right now". The history of this bill is somewhat troubling. Suffice to say New York once had a clean, unrestricted access bill which had been sponsored by over 2/3 of the Assembly. In June 2014, that bill was inexplicably "amended" to what we have before us now. No hearing. No debate. Completely different language just magically appeared. Many sponsors didn't even know about the last minute changes or assumed the changes were relatively minor. They weren't. That version of an "Adoptee Rights Bill" has been with us ever since, passing the Assembly, but not the Senate, in 2015 and 2016, and both chambers this year. Interestingly, A5036B's lead sponsor, Assm. David Weprin, also introduced A6821A, the "same as" companion to the clean, unrestricted access bill S5169A introduced in the Senate by Sen. Tony Avella. Neither bill made it out of committee while the bad bill that is A5036B/S4845B advanced. 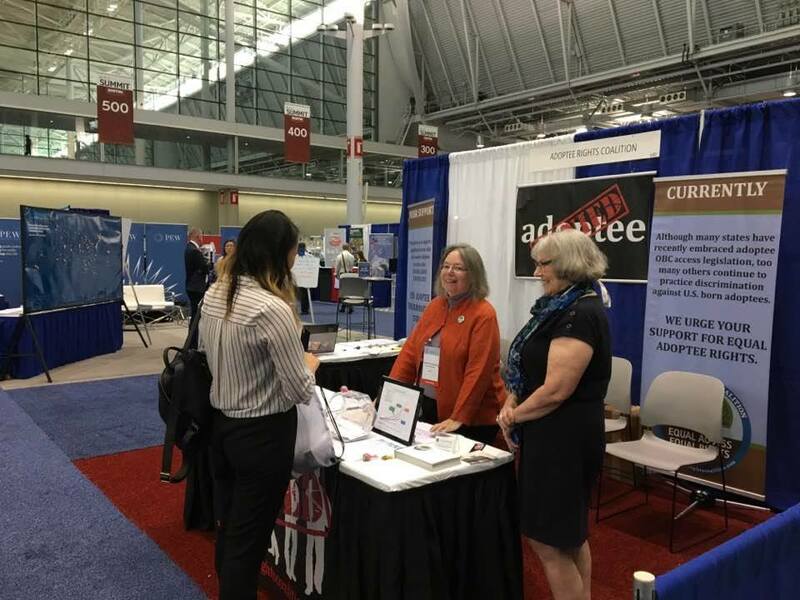 Advocates for adoptee rights are trying to get A6821A/S5169A back on track. On August 22, Senate Democratic Conference Whip Kevin S. Parker sent a letter to Gov. Cuomo urging him to veto A5036B and to "work with the Legislature to pass S5169A/A6821A so that we may enact a worthy New York Law of Adoptee Rights." But how bad is A5036B, really? It is similar to Pennsylvania's short-lived "search and consent" experiment (part of Act 101) and we all know what happened there. Last year, Pennsylvania repealed that cumbersome, inequitable, and costly experiment, and replaced it with a centralized procedure, allowing adoptees to obtain original birth records directly from the Department of Health within 45 days of application. Cost to the adoptee: $20. A5036B should not be New York's "experiment" as Act 101 was in Pennsylvania. Supporters of A5036B argue that it's "only a first step" that will still help many adoptees. How many will actually be able to obtain their OBCs depends largely on how the Surrogate's Court judges react to implementation of a new law. So far, they've been strongly opposed to any changes to existing law. "...the majority of them in the Surrogate's Court Association feels that the current law is sufficient." Hon. John M. Czygier, Jr.
"...the current law, Domestic Relations Law 114, already effectively balances these somewhat competing interests by permitting access to sealed adoption records for good cause shown." "...the existing procedure we have to provide for the release of information for legitimate reasons is a procedure that works. The proposals to expand access to information for no discernible reason other than a desire to know, could result in devastating consequences." "... it is clear that this rationale [for unrestricted access] is simply a smokescreen for the true purpose of this bill, which is the forced revelation of a birth parent's identity without their consent and is in actuality a violation of their human rights." "The Surrogates Association is willing to endorse any legislation that would improve the administration of justice or establish a meaningful remedy for individuals who are in need thereof. Regrettably, this proposed legislation does neither and in fact, in the opinion of the majority of our members would cause more harm to a greater number of persons than it would in fact assist. Therefore, we must oppose its passage." It looks like the judges who will be reviewing your application are the same ones who have been denying 99.9% of petitions under the current law and they think current law is just fine as it is. So what does A5036B actually say? If birth parent consent is obtained by the Department of Health, the Court would order the DOH to release the OBC without redaction. If a "confirmation to maintain confidentiality" (aka disclosure veto) has been submitted, the Court will order the DOH to release the OBC with that parent's identifying information redacted. Note that in New York State, identifying information includes the adoptee's actual place of birth and the places of birth of the biological parents. Otherwise, the Court decides if releasing an unredacted copy would be "clearly detrimental to the welfare of the birth parent or parents". Sounds like the standard "only a few will be denied" scenario, right? Here are the steps. Read them with the knowledge that judges will be determining policy and procedure at most points in the process. STEP 1: "AN ADOPTED PERSON WHO HAS ATTAINED THE AGE OF EIGHTEEN YEARS MAY APPLY TO THE COURT IN WHICH THE ORDER OF ADOPTION WAS MADE, OR TO THE SUPREME COURT, TO REQUEST AN ORDER RELEASING A CERTIFIED COPY OF HIS OR HER ORIGINAL LONG FORM BIRTH CERTIFICATE..."
Each of New York's 62 counties has a Surrogate's Court, a Family Court, and a Supreme Court. Are they all going to have the same forms, the same procedures, and the same costs for obtaining the OBC under A5036B? Probably not. Like A5036B would do,Pennsylvania law had previously required adoptees to apply to the Courts where, according to Julie Sterner of Pennsylvania Adoptee Rights "there were huge disparities between costs and procedures in different counties". STEP 2: "THE COURT SHALL PROVIDE THE DEPARTMENT OF HEALTH, OR ORDER THAT SUCH DEPARTMENT BE PROVIDED, WITH THE IDENTIFYING INFORMATION OF THE ADOPTED PERSON'S BIRTH PARENT OR PARENTS..."
The New York State Adoption Information Registry at the DOH is already sitting on identifying information for over 40,000 adoptions. Presumably, most adoptees requesting their OBCs would have already registered with the DOH and their information would have previously been obtained from the court - a process that usually takes at least six months according to the Registry and even up to a couple of years according to long time adoptee support group admin Joan Edelman. Will A5036B make the courts move any faster? If the adoptee tells the court that the DOH already has their identifying information, will that help? STEP 3: "THE DEPARTMENT OF HEALTH SHALL ... DETERMINE WHETHER SUCH PARENT OR PARENTS HAVE ALREADY FILED A WRITTEN CONFIRMATION [to maintain confidentiality] WITH THE COURT OR THE DEPARTMENT OF HEALTH ... OR A BIRTH PARENT REGISTRATION CONSENT FORM WITH THE ADOPTION INFORMATION REGISTRY..."
Consent or "confirmation to maintain confidentiality" can be filed at the DOH or at any of the courts in any of NY's 62 counties. Can the adoptee simply attach a notarized consent (or even a copy of one filed elsewhere) to the application? That would tell the DOH where to look at least. STEP 4: [If no "confirmation to maintain confidentiality" or consent is found,] "THE COURT SHALL ... DIRECT THE DEPARTMENT OF HEALTH TO MAKE A REASONABLE AND GOOD FAITH EFFORT, DOCUMENTED IN WRITING AND COMPLETED WITHIN ONE HUNDRED TWENTY DAYS, TO NOTIFY THE BIRTH PARENT OR PARENTS AND ADVISE SUCH PARENT OR PARENTS THAT THE ADOPTED PERSON HAS MADE AN APPLICATION PURSUANT TO THIS SUBDIVISION." Supporters of A5036B point to the 120 day window as indicative of when they'll be able to obtain their OBCs. If the courts continue to move at a glacial pace (see STEP 2), adoptees won't even reach this point until several months after application. Further, no funds have been requested to train DOH employees in search methods, or to hire experienced searchers. We've been assured that the expenditures will be minimal and that adoptees will NOT have to pay for the searches. One wonders if the adoptee could simply submit a copy of a parent's death certificate to save the DOH the time and expense of "searching" in the first place. Most adoptions are not voluntary infant surrenders. In cases of step-parent adoption, is the DOH going to try to get consent from a possibly abusive ex-spouse? In cases of adoption from foster care, will the DOH contact birth parents whose parental rights were terminated due to abuse or neglect, requiring the adoptee to get "permission" from his or her abusers even if the adoptee knows their names? As usual, the court dictates the parameters of the search and notification process. "SUCH NOTIFICATIONS AND ADVISORY GIVEN SHALL COMPLY WITH ANY TERMS AND CONDITIONS SET FORTH BY THE COURT AND SHALL BE MADE BY MEANS DESIGNED TO BE SENSITIVE TO THE PERSONAL NATURE OF THE MATTER." Given that there would probably be a rush of OBC applications on April 15, 2018, when the law is set to take effect, when does the 120 day clock start ticking? How will the DOH cope with conducting hundreds of court prescribed searches all at once? Of course, the predictable backlog at the DOH is only a problem if the courts are quick to tell them - "You already have this information. Feel free to use it." How many parents will actually be found and contacted by DOH personnel within the 120 day window? Could the DOH conceivably run out of time to complete many of the searches? Do you see a problem here? STEP 5: " IF ... THE BIRTH PARENT IS UNABLE TO BE NOTIFIED OR DOES NOT RESPOND TO SUCH NOTIFICATION, THE DEPARTMENT OF HEALTH SHALL SO NOTIFY THE COURT." I think it's fair to say that any parent who is already deceased will be "unable to be notified" and/or will not respond. So in that case, the adoptee gets the OBC, right? "UNLESS THE COURT, IN ITS DISCRETION, FOR GOOD CAUSE SPECIFIED IN ITS ORDER, DETERMINES THAT THE RELEASE OF SUCH BIRTH CERTIFICATE OR IDENTIFYING INFORMATION WOULD BE CLEARLY DETRIMENTAL TO THE WELFARE OF THE BIRTH PARENTS, THE COURT SHALL: RELEASE ... AN UNREDACTED, CERTIFIED COPY OF THE LONG-FORM BIRTH CERTIFICATE TO THE ADOPTED PERSON ... "
So the default is NOT for the adoptee to get the OBC if the parents are deceased. The Court weighs in first. How does the Court make a determination as to whether release would be "detrimental"? With A5036B, the judge will need "good cause" to redact identifying information from the OBC - but he or she will have wide latitude. 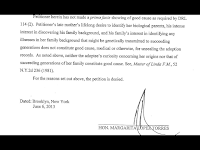 "FOR THE PURPOSES OF THIS PARAGRAPH, GOOD CAUSE SHALL INCLUDE BUT IS NOT LIMITED TO, EVIDENCE CONCERNING THE WISHES OF THE BIRTH PARENT REGARDING CONFIDENTIALITY AS EXPRESSED AT THE TIME OF THE ADOPTION OR SURRENDER." "Including but not limited to" allows the judge to look at anything he or she believes may be informative as to the wishes of the biological parents several decades ago, including discussions with colleagues about their past practices, and possibly even the judge's own general recollections, assumptions, and bias. "In most cases, the parent would say, no, I'm giving this child up for a reason because if I have a family 30 years from now with three children and a husband, I may not want someone knocking at my door saying, guess who I am?" "...in every case where there was a promise made of confidentiality, I think that promise must be honored." "It should, it can also be presumed, I think, that that natural parent may not want to relive that decision sometime in the future, based solely on the curiosity of someone who wants to view the birth certificate." "... this legislation provides that the identity of the birth parent be made public in spite of the state's past promises of anonymity. On that basis alone, the retroactive application of this legislation is totally unjust." It's difficult to predict what judges will do as the only available case law has been developed under current statute, but the testimony by high ranking Surrogate's Court judges at the 2014 Health Committee hearing may offer some clues - and it doesn't look like they'll be lenient. So what are the chances that a New York adoptee will be successful in obtaining their OBC if A5036B becomes law? Is the adoptee in contact with a living parent who has filed or would be happy to file a consent? Most would say the chances are pretty good. Is the adoptee in contact with the family of a parent who is now deceased? Presumably, the adoptee can attach a copy of the death certificate and affidavits from family members as to the relationship, including the fact that the adoptee had a good relationship with the parent prior to the parent's death, if applicable. Will that be enough? There's nothing in the bill about the adoptee providing proof of the parent's death. Will the DOH still have to "search" for the parent whose death certificate is attached to the adoptee's application? As Greg Luce's "The Nutso World of New York Adoptee Rights" shows, logic is not a strong point when it comes to releasing the OBC in New York. 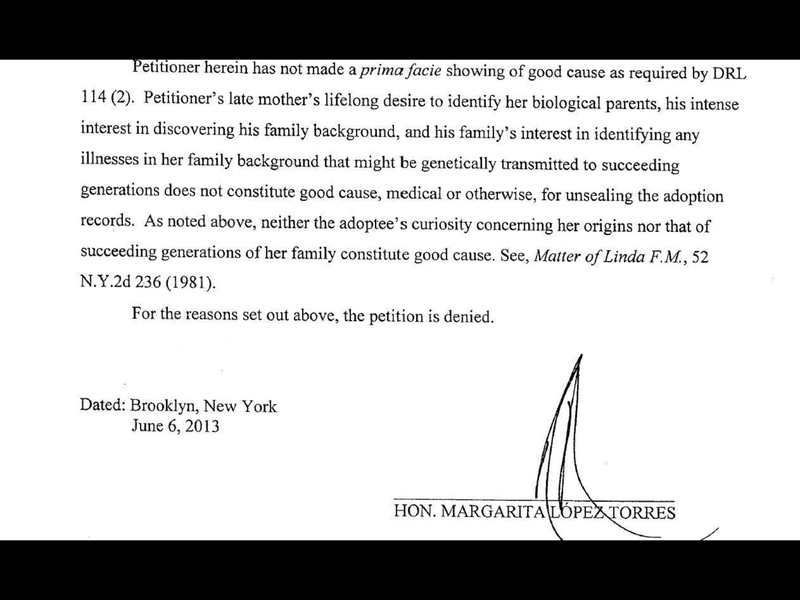 Judges have not been very accommodating to adoptees and their petitions. Is the adoptee still trying to identify their biological parents? (and if you haven't had your DNA tested with Ancestry.com, what are you waiting for?) It's going to depend on whether the parents are found alive by the DOH - if they are found at all. People have argued that releasing the OBC where the parents are deceased should be a no-brainer. How could it be "detrimental" to the parents if they are deceased? Easy. Is there a surviving spouse? Are there other children? New York's current system of groveling before judges is bad enough. A5036B creates a new mandate of denying the adoptee and giving veto power to birthparents - taking away the judges' discretion even in cases where the parents were abusers who lost custody. A5036B gives NO access to the children, grandchildren, and all future lineal descendants of adopted New Yorkers. Since 1936, there are genealogists all over the USA who have hit a brick wall with a New York adoption, never able to see their State records or to obtain proof of bloodlines for lineage societies and dual citizenship. A5036B has been promoted as a "first step" but it is clearly a step backward. New York has a simple, clean, unrestricted access bill in A6821A/S5169A. There is no need for a complex, costly, and restrictive bill like A5036B.